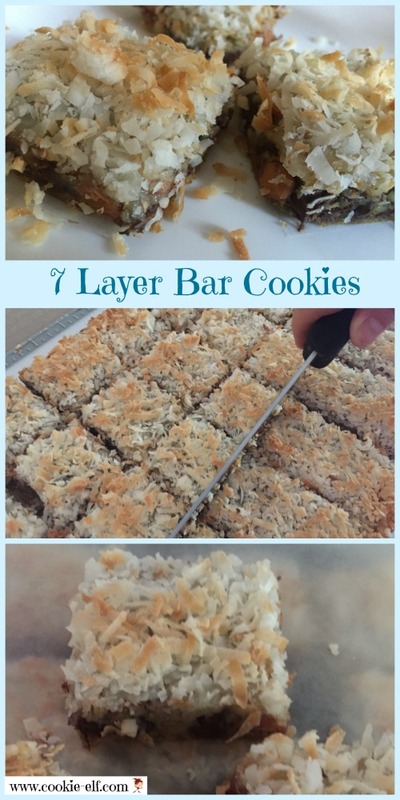 7 Layer Bar Cookies: So Easy – No Mixing! 7 Layer Bar Cookies are an easy bar cookie recipe that has been around more than half a century. There’s no mixing. None! Each layer is pressed, sprinkled, or poured into the pan. That means it goes in the oven quickly and there’s hardly any mess. Plus, the bars are not fussy. They always look great and taste great. Line a 13 x 9 baking pan with aluminum foil. Spray the sides of the foil to prevent bars from sticking to the sides of the foil when you remove bars. Cut the butter into the pan. Set the pan in the heated oven to melt. Remove the pan from the oven. Sprinkle graham cracker crumbs evenly over the melted margarine. The crumbs will be absorbed by the butter to create the crust. Gently shake the pan back and forth sideways to allow excess crumbs to be absorbed. Layer chocolate chips, butterscotch chips, and chopped nuts evenly over the crust. Pour sweetened condensed milk evenly over bars. Use an angled spatula to spread milk into spots that are not covered. Sprinkle the coconut on top. Bake bars 25-30 minutes until lightly browned. Remove the pan from the oven and allow it to cool completely on a wire rack. Lift the foil out of the pan and set the bars onto a cutting board. Peel away foil. Cut the bars. Assemble the layers in the exact order indicated in the the recipe. Make sure to sprinkle coconut on last so it is toasted while baking. See more easy bar cookies recipes on our Bar Cookies Pinterest board.